The Dream Away Lodge is a go-to destination during tourist season and a favorite gathering place for locals off season. But the adventure begins before you even step inside the building. Located just on the edge of the 18,000-acre October Mountain State Forest, the restaurant sits on its own 50 verdant acres. We got there just before night settled, so we were able to take in the colorful gardens and walk through the lodge’s lovely wildflower meditation labyrinth. Had we arrived earlier, the grounds open to miles of walking trails, birch groves, ponds, and a popular event space in a forest glade known as the Wedding Rock. Our friends’ daughter claims she’s getting married there — pending the acquisition of a prospective husband. In 1997, Mama Frasca’s oldest daughter, Tess, sold the lodge to Daniel Osman, who crafted it into its current incarnation as a cozy, warm restaurant/bar with live music (or art, theater, cabaret, spoken word events) almost every night, including a popular open mic Hootenanny on Wednesdays. The son of folk singing parents, Osman spent more than 35 years in the theater, supplementing his career as an actor/director/producer with extra work in the food and hospitality industry. He has imbued Dream Away Lodge with a quirky theatrical flair — he calls it a kind of “reality dinner theater,” his “longest running and most critically acclaimed production.” Special events sprinkled throughout the year take it up a notch. “Halloween here rocks,” he says. 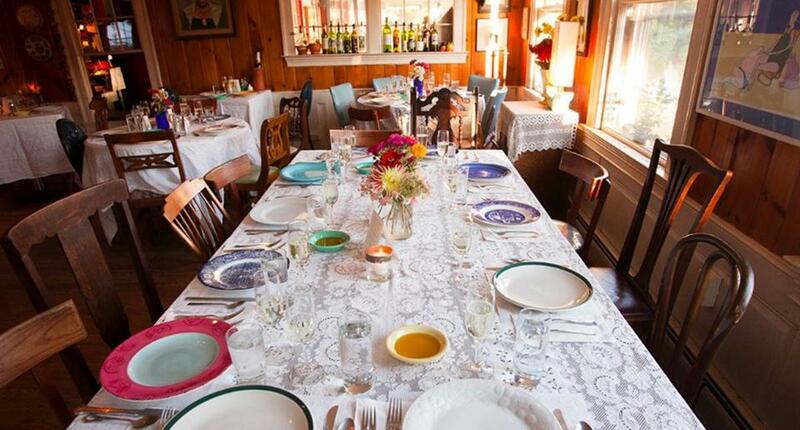 Playful and homey, the restaurant’s vibe is shabby chic, with multi-hued, mismatched linens, dishware, and furniture. Kitschy knickknacks, signs, books, and colorful art abound. The bawdy bathroom art (affectionately dubbed the “Loo Gallery”) is worth a special visit. The bar, constructed of multicolored light blocks, is presided over by a naked picture of Marilyn Monroe. It’s a loose, open feel. From Memorial Day through Labor Day you can eat outside as well. Patterson the dog and cats Stoner and Sam (all named to recall the Rolling Thunder Revue) casually wander in and out. Dream Away Lodge’s vibe is shabby chic, with mismatched linens, dishware, and furniture. However, people come not just for the atmosphere, but for the imaginative and affordable menu of really fresh locally grown and sourced food. Berkshire native Amy Loveless, raised on a farm in Stockbridge, brings authenticity and integrity to her “farm to table” dishes as the restaurant’s head chef since 2008. She also favors an eclectic mix of Mexican, Middle Eastern, and Asian flavors in her seasonal menus, with modest offerings of gluten-free, vegetarian, and vegan options, making this a sweet spot for a big group with mixed dietary needs. She makes desserts in her commercial kitchen at home each morning, and they’re well worth the calories, and the burgers (sirloin and local grass-fed, when available) are outstanding, including the tastiest lentil burger we’ve ever had. A surprisingly extensive wine list offers glasses and bottles from around the world, but don’t miss the excellent cocktails as well: The place is known for its margaritas, which are sharp and crisp with just the right amount of lime. A wide selection of teas and quite excellent coffee are free and self serve, which is a gracious, chill-busting amenity on cool nights. Music continues to be a big draw into the post-dinner hours. During the summer performing arts season, actors, dancers, and musicians dropping by after shows can ramp it up to a party-like energy. We finished dinner just as a local band — a trio of guitarists and a harmonica player — were starting to lay down some sweet bluegrass in the music room. You can squeeze in and settle down in one of the padded pews, grab a chair, or just loiter by one of the doorways until you’ve had your fill, which was what we did, happy to stand after a long sit down over a terrific meal. And when we headed out into the night back toward our car, the music came with us, gently wafting through open windows to send us on our way. 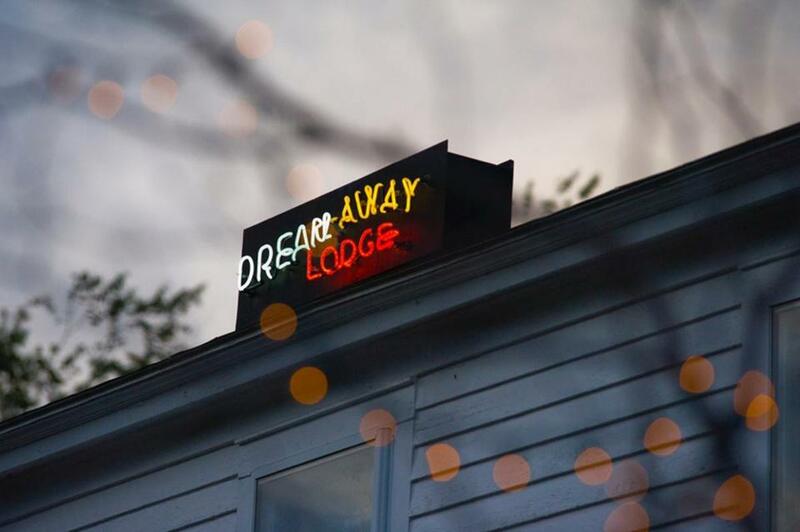 Dream Away Lodge, 1342 County Road, Becket, www.thedreamawaylodge.com, 413-623-8725.